In the first blog posting in this series I provided the “helicopter-view” of the year’s releases, which is probably the place to look if you want a quick overview. The rest of this series will consist of more details about individual 2018 releases. Chaosium launched its online community publishing portal, the “Miskatonic Repository,” just a few days before the end of 2017. Thus, 2018 was really the first year that a large number of titles has been made available via this channel. So, with the benefit of 12 months of operation, how has the Miskatonic Repository evolved? As mentioned in the summary introduction for this review, quite a number of products have been made available via the Miskatonic Repository in 2018 – about 44 titles with English-language content (plus two or three that are exclusively in other languages). Now obviously that’s far too many titles to describe each individually, but here are some general trends. Paid titles versus Free/PWYW: when the MiskRepo launched, much was made about the choices afforded to creators about asking a fixed fee for their PDF, offering it for free, or making it a “Pay-What-You-Want” title. In 2018 some 25 of the 44 titles were offered on a fixed fee basis, 6 were entirely free, and the remaining (13) were Pay-What-You-Want. Brand New content versus Reprinted content: Most of the items added to the MiskRepo were items that (as best I can tell) had never been published before. There were some exceptions: like Jim Phillips’ “Legs” which has been a free PDF on other sites previously, as had several titles by Dr. Michael LaBossiere. All of these reprints are, however, either free of PWYW. Established Writers versus New Talent: The majority of new PDFs on the MiskRepo seem to have been written by authors who have not previously published game material (for Call of Cthulhu at least). Notable exceptions are the two scenarios by Adam Gauntlett (The Man Downstairs and Hocus Pocus), one by Jon Hook (The Night Door), and a scenario by John Almack (Moonglow). Classic Era, Modern, or something Weird: There has been a typical spread of different time periods and settings explored in 2018 MiskRepo titles – numerous classic-era scenarios and campaigns, several modern-day titles, and a few with more exotic settings (one in the 1980s, and a couple set in World War II). Standout Titles: It’s quite hard to pick standout titles without having read every PDF, but if I had to mention a few that look quite promising I’d pick: Tomes of Terror, The Man Downstairs, A Light In Darkness, and The Night Door. Most of the 2018 releases discussed so far in the review have come from a “family tree” of games which has its root in the venerable Call of Cthulhu (but which now has branches that sprawl far beyond). However, the RPG world is a diverse place and there’s a lot published outside that “family tree” which also has ties to Lovecraft in some way, shape, or form. It’s obviously far harder to pin down a definitive list of such titles, but here’s a (possibly imperfect) summary. These products, while separate from the main body of traditional “Cthulhu” titles still retain some kind of link back to it. 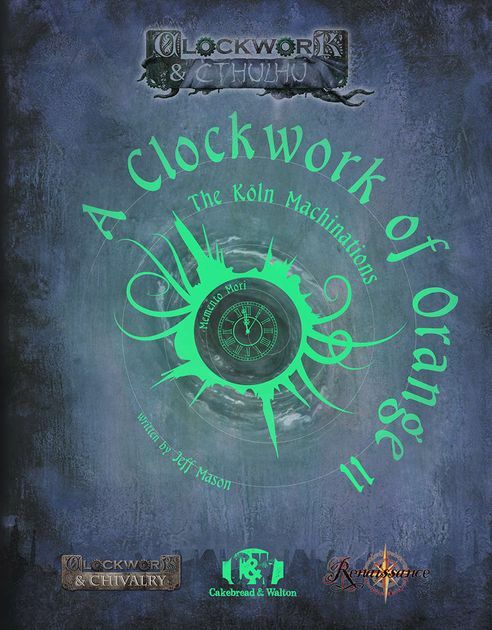 Renaissance – A Clockwork of Orange II: The Köln Machinations (Cakebread & Walton): Another game that is derived from the BRP system but separate from it is the Renaissance system by Cakebread & Walton, used for a couple of different Lovecraftian settings – Dark Streets (17th Century England) and Clockwork & Cthulhu (English Civil War). In 2017 Cakebread & Walton kicked of the publication of a four-part campaign for Clockwork & Cthulhu called “A Clockwork of Orange.” This sprawling campaign is set in 1610 and takes characters across many regions of continental Europe. It has a very deep and rich historical tone to it. 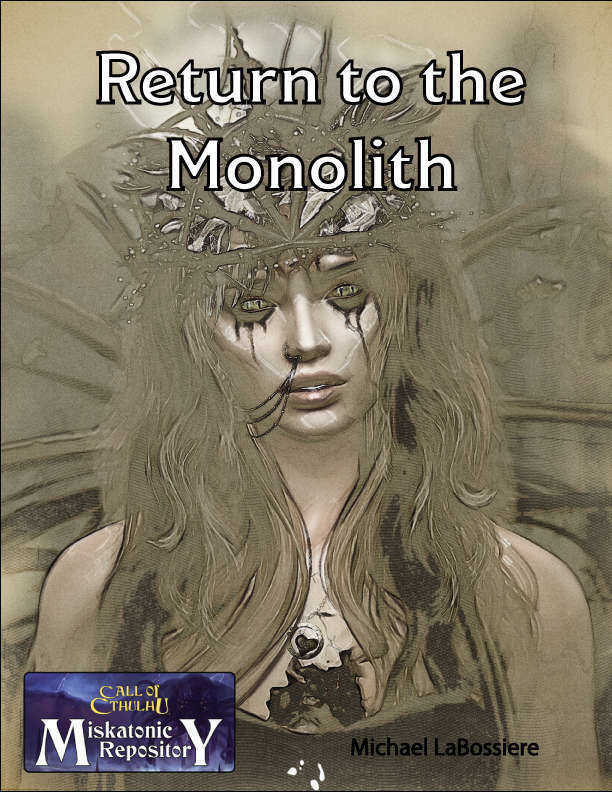 Part 2 of this campaign came out in 2018 and features some alchemical action in the free city of Köln. Cthulhu Dark (Thieves of Time): Graham Walmsley’s super-minimalist game system Cthulhu Dark has been out for quite some time, with its glossy hardcover book having been successfully delivered in 2017. However, pieces of that Kickstarted project – in particular, PDFs included as part of the backstage “season pass” purchased by some backers – trickled into early 2018. “As Good As A Feast” by Mo Holkar is a 1930s scenario in which hungry travellers from the central US ‘dust bowl’ seek out a better life. “The Whole Is Greater” by Chris Spivey is a mystery set on the fields of WW1 France and features the African-American soldiers of the Harlem Hellfighters (also written about by Chris in 2017’s Harlem Unbound). Nameless: In early 2018 the Innsmouth House Players, the high-profile troupe of gamers who regularly make Actual Play recordings of their playthroughs of Lovecraftian games and share them via the Yog-Sothoth.com online community – announced they were ceasing their 13-year run of recording Call of Cthulhu games. In place of those recordings (which are much loved by many), the group announced that it would be creating its own “house system” for use in future Lovecraftian game recordings. This new system came to be called “nameless” and while it has never been published or released, the 20+ recordings of games using nameless make it fairly easy to figure out how this rules-light/roleplaying-heavy game works. So far, the recordings of nameless games have only been released to YSDC patrons, however if you are such a member they are free downloads and well worth a listen (in particular the Manderley Mysteries series of recordings). Other game titles were published in 2018 with strong Lovecraftian pedigree but which really have no connection with the “family tree” of games derived from Call of Cthulhu. Rather they are games or supplements where a bright designer has taken an entirely different ruleset of style of tabletop gaming and cross-pollinated it with ideas from Lovecraft’s bleak cosmic view. Or just added his be-tentacled monstrosities in for effect. Knowing where to draw the line with including games for such a list is extremely difficult and for my own sanity I’ve only mentioned games and products which explicitly claim some kind of connection with Lovecraft’s writings. There are literally dozens of additional games which somehow bake Lovecraftian ideas into their core DNA without mentioning it explicitly but tracking all those down would take a lifetime. 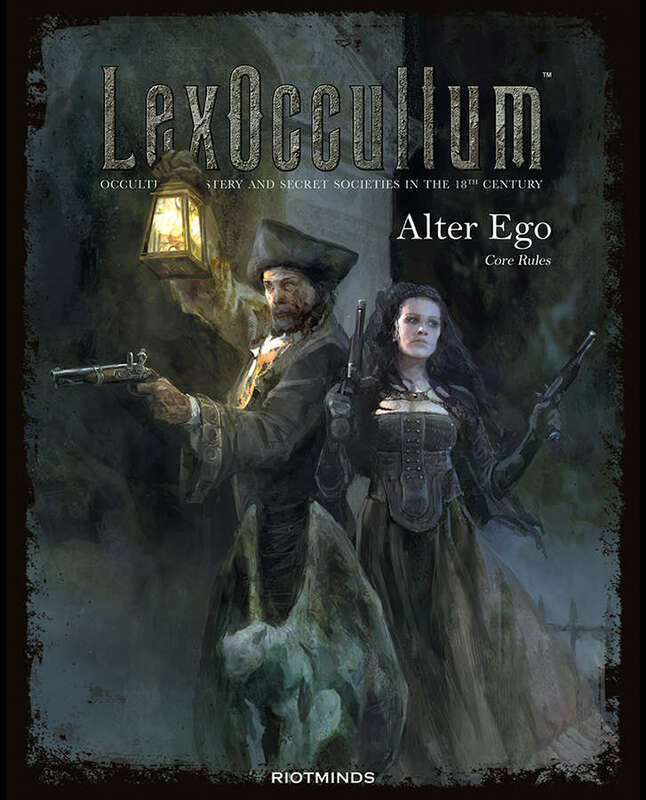 (I would however like to mention a couple of ‘boundary cases’ which I was tempted to include, namely the beautifully-illustrated LexOccultum from Swedish company RiotMinds – a game of 18th Century Occult Investigation – and the ongoing excellent support for Atlas Games’ modern-day urban occult game Unknown Armies). Eldritch Tales (Raven God Games; using Swords & Wizardry White-Box Rules): Folks who follow the tabletop RPG industry more broadly will doubtless be well aware of the “revolution” surrounding the OSR (“Old School Revival”) movement. In a nutshell, this is an effort to recreate some of the styles of play typical of early editions of D&D and AD&D. In 2018, a team of folks created an OSR game which is inspired by the writings of Lovecraft and set in the “classic era” of the 1920s. 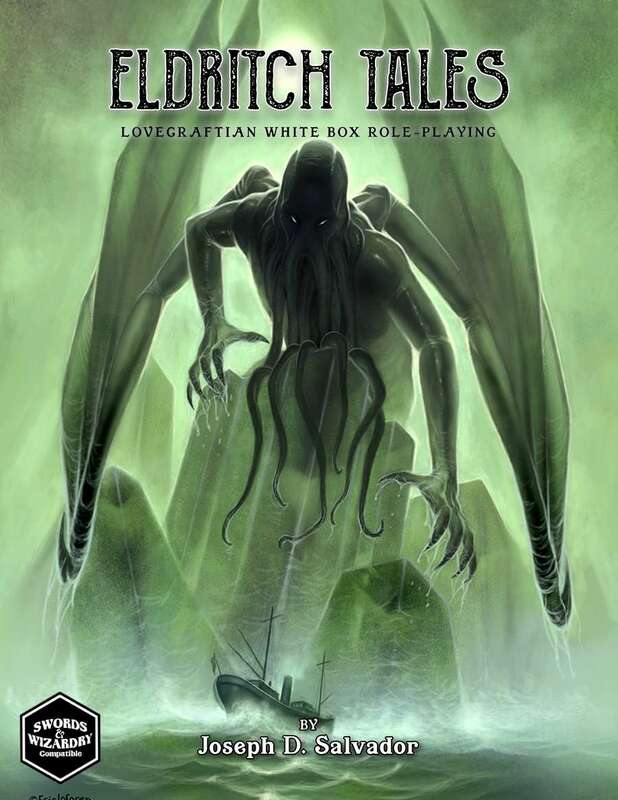 That game is called Eldritch Tales, published as a 218-page book which serves as a standalone game (although deriving mechanics from the Swords & Wizardry White-Box, which themselves derive from D&D). It’s quite a well-produced and attractive title and covers the usual range of topics you’d expect in a core ruleset (characters, skills, magic, adversaries, eldritch artefacts). Basically, it feels exactly like what Call of Cthulhu would have felt like in 1983 had it had been built as a clone of D&D with eldritch influences. One notable thing about this extensive ruleset is that a significant amount of it is published under the OGL, making the possibility of extended OSR-related titles much more possible. Herald: Lovecraft & Tesla (Ravendesk Games; using the Savage Worlds rules): There have been previous attempts to create Lovecraftian games using the cross-genre Savage Worlds rules, most notably 2009’s Realms of Cthulhu. But the 2018 release of Herald: Lovecraft & Tesla is something quite different, an exercise in taking a comic franchise and using its backstory and characters to build out a gaming world. 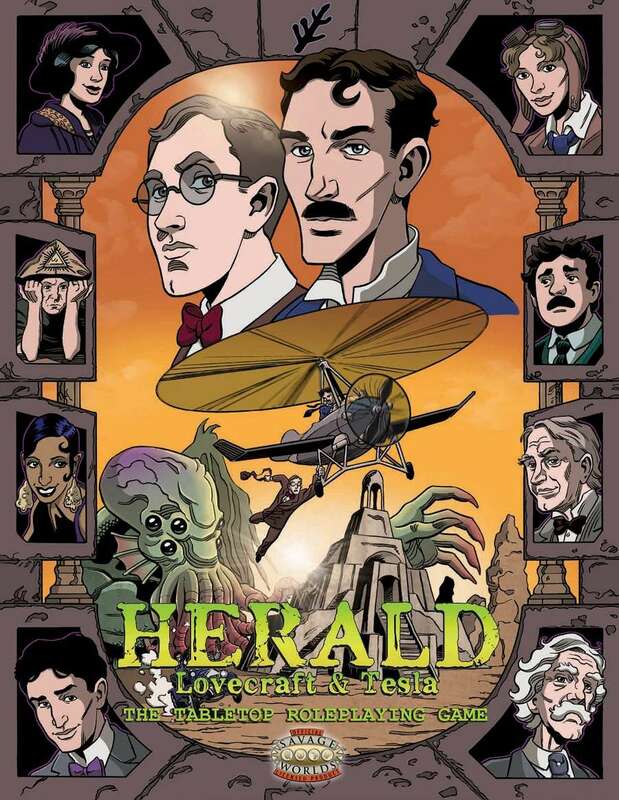 Those familiar with the “Herald: Lovecraft & Tesla” comic (published by Action Lab comics from 2014 to 2016) will know that it’s set in the “roaring twenties” and the tone of storytelling is very much in the high-pulp mode, with historical figures being repurposed as needed to make for a ripping yarn. Thus, the protagonists of the comics are Nikola Tesla and H.P. Lovecraft and their adventures have them crossing paths with pulpified versions of Amelia Earhart, Harry Houdini, and the like. In many ways the world of Herald: Lovecraft & Tesla is what Chaosium’s Pulp Cthulhu is striving to be, although perhaps even moreso. The nature of the Savage Worlds rules – themselves more than a little pulpy – makes this kind of storytelling feel a lot more natural than it does with BRP. The rulebook for Herald: Lovecraft & Tesla is beautifully illustrated and contains all the character-related and setting-related information you’d need (obviously you also need the Savage Worlds rulebook). The book also contains six “one-shots” (short scenario sketches) as well as five longer adventures. 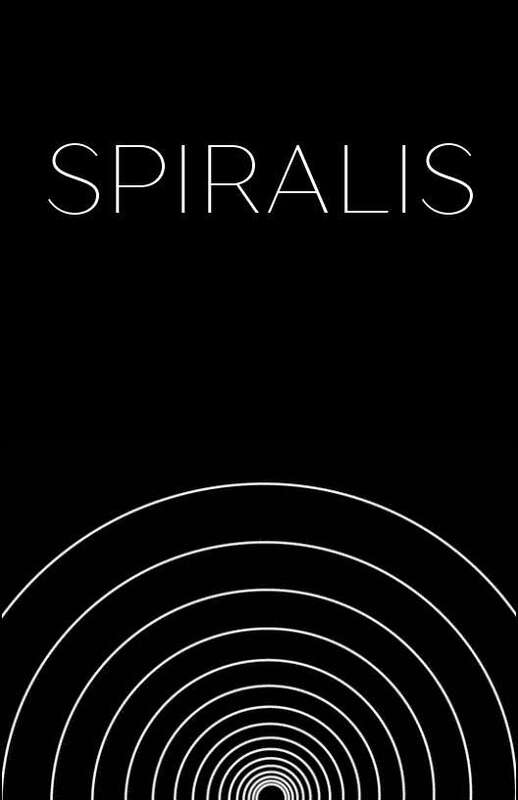 Spiralis – A Lovecraftian Roleplaying Game (Trail of Dice): As mentioned above, the publication of Cthulhu Dark several years back has proven that Lovecraftian tabletop RPGs don’t need to be mechanically complex to still convey the looming-sense-of-doom that is important to the HPL “mood.” Cthulhu Dark is, however, very minimalist – perhaps too much so for some gamers. For such folk Spiralis, published in 2018, presents a similar type of game but with a little bit more mechanical “crunch.” Inspired directly by both Cthulhu Dark and the family of “Powered by the Apocalypse” games, Spiralis features player characters largely defined by three variable statistics (sanity, stamina, and standing) which can go down as the result of unfavourable outcomes. Die types are associated with each (D6, D8, D10) and any of them can function like an Insight Die in Cthulhu Dark, offering a higher chance of success at the risk of a dangerously bad outcome. One might argue that the cross-pollination of Lovecraftian creatures into fantasy RPGs goes all the way back to the (brief and controversial) inclusion of the Cthulhu Mythos in the AD&D Deities and Demigods back in 1980. However, in more recent years, the trend towards borrowing Mythos creatures for games such as Pathfinder have become a much more standard practice. Indeed 2017’s rather inappropriately named Sandy Petersen’s Cthulhu Mythos for Pathfinder set the stage for the Mythos to be a more mainstream ongoing element of fantasy games. Here’s (some of) the fantasy/horror crossovers published in 2018 which featured the Cthulhu Mythos in some way. 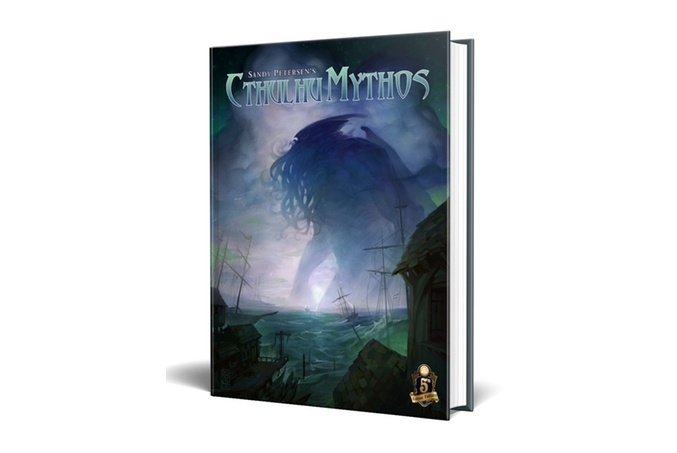 Sandy Petersen’s Cthulhu Mythos: As mentioned above, the Pathfinder edition of this inexpertly-titled 500-page tome was a massive Kickstarter success in 2017. In 2018, Sandy went back to the same well and ran another Kickstarter to fund the creation of a version of this book for D&D 5th Edition – that KS campaign was also a huge success, attracting over 4,000 backers. 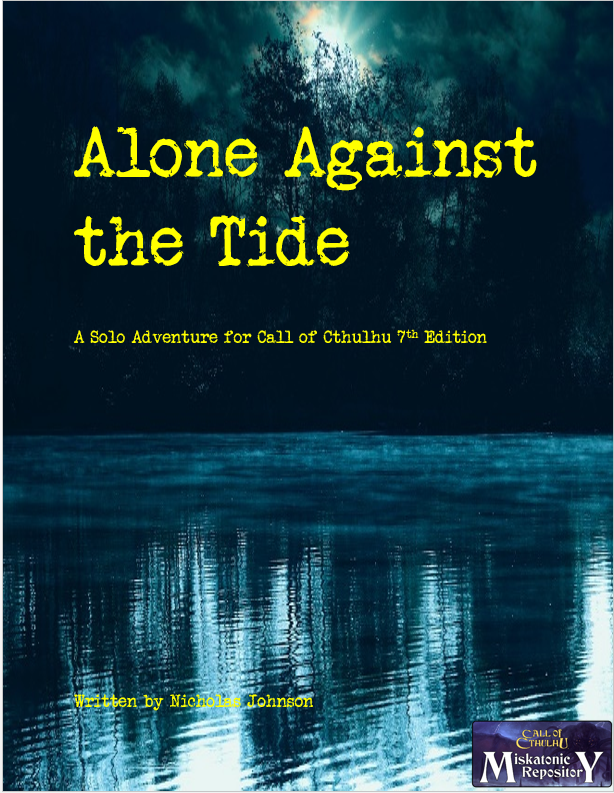 In addition to this, Petersen Games also published its first scenario tied in to Sandy Petersen’s Cthulhu Mythos, Silence from Sommerisk. This 34-page adventure (statted for Pathfinder) revolves around a region in a typical fantasy world which has become overlapped with the reality of H.P. Lovecraft’s Dreamlands setting. Modiphius’ Horrors of the Hyborian Age (for the Conan 2d20 RPG): The newly-rebooted Conan RPG published by Modiphius (Conan: Adventures in an Age Undreamed Of) has spawned a long list of supplements in a relatively short space of time. These have covered all manner of topics derived from Robert E. Howard’s fiction. In 2018, Horrors of the Hyborian Age was published as a bestiary of dark and horrific entities. Some of these resemble traditional horrors, but many others have a definite Lovecraftian flavour (Byakhee, Children of N’Kai, Yithians, Dimensional Shamblers, Hounds of Tindalos, Hunting Horrors, Mi-Go, etc.). 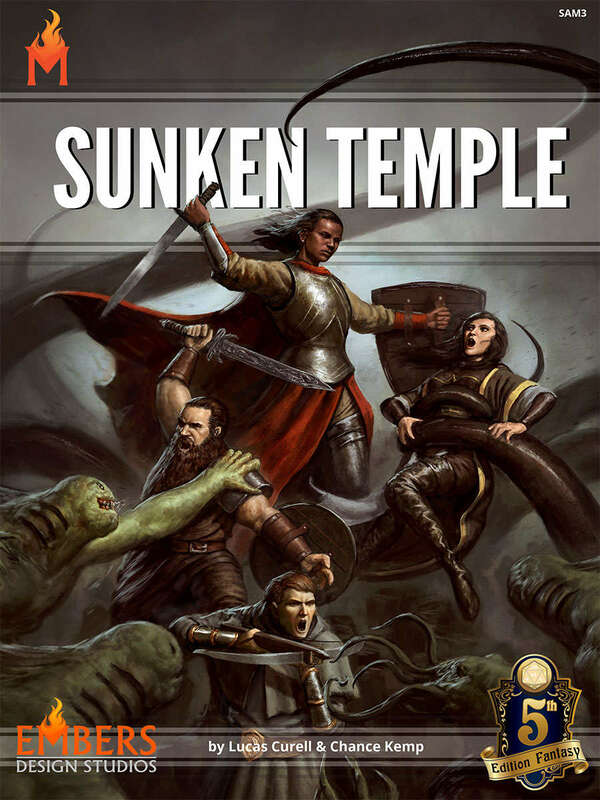 The Sunken Temple (Ember’s Design Studios): A Kickstarter campaign was run in 2016 for the creation of a horror-themed fantasy scenario called The Sunken Temple, with different published versions catering to Pathfinder, D&D 5e, and W.O.I.N. rulesets. In 2018 versions of the scenario made their way to backers along with a second book unlocked as a stretch goal (The Black Book of B’Nar, a bestiary of Lovecraftian nasties). “The Horror” expansion for the Expedition RPG (Fabricate): Expedition is a very simple card-based RPG which exists as a freely-downloadable print & play game or as a professionally produced deck of cards. In 2018, “The Horror,” an expansion to this RPG, was produced as the result of a successful Kickstarter. This entry was posted on Thursday, January 31st, 2019 at 11:07 am	and posted in News & Updates. You can follow any responses to this entry through the RSS 2.0 feed.